Integrated access control solutions come in many different forms from lots of different manufacturers but Paxton Access control systems are some of the best, most flexible and competative in the security industry. Paxton are arguably the market leader today for access control in the UK. The NET 2 access control system is their primary product and is a PC based system with the user database held on a host PC. The access control software is able run door controllers servicing up to 50,000 users. 3 main door controllers are at the centre of the Paxton portfolio, all designed to fit into different scenarios dependant on the layout of the site. These are the Net2 plus, Net2 nano and Net2 classic . The Paxton classic is an RS485 based system. Each controller will accommodate 2 readers and sits above the local door requiring control. Paxton’s thinking and one of the main reasons behind its success is that it is able to fit into just about every situation required and because of the simple topology the system can be build to a large scale and still remain cost competitive. It’s simple for more doors as well, just add another controller. Add up to 500 doors in this manner and up to 50,000 users and you have a very flexible solution. Now IP access control is central to most security installations Paxton has introduced the Net2 plus. 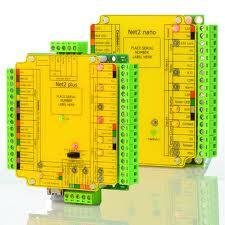 Net2 plus is an IP based controller. The Net2 plus controller is able to integrate with the classic. If you are in a situation where you need to expand an existing system you are able to mix and match the Net2 classic and the Net2 plus to gain the most cost effective solution. Paxton have also realized that wireless controllers in certain situations cut the cost of installations. 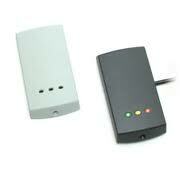 For a wireless access control solution you will need to use the Net2 Nano. This door controller it can connect to the network through a 2.4GHZ radio path. Once again the Paxton Net2 nano fits alongside both the classic and the Net2 plus for seamless integration. Paxton Net2 has become a favorite amongst installers because of cost effectiveness ease of installation and the readers are well finished and classically designed, it seems that customers needs can always be answered so Paxton have a firm grip on the market place. Its not just doors that can be run with the Net2 system. Building management systems are easily integrated. Paxton also produce many ancillary products such as the I/O unit (input /output) to ensure seamless integration between different security and building management solutions. All types of access control reader solutions are also available.Vandal proof readers, keypads, biometric fingerprint scanners to name a few. Most third party readers can also be integrated into the the controllers again assisting installers keep costs down when taking systems over. The paxton website that is is one of the best in the security industry,Paxton staff are always on hand to provide technical support for registered installers and downloads of the latest firmware always available. An excellent loyalty scheme is in place and this ensures that installers are always keen to go back to Paxton when they have new installations to quote for. The units are all manufactured at a specially designed factory site in Eastbourne, Paxton are UK through and through.What is more their products are reknowned for reliability.Integrtaed access control soultions are a growing business and Net2 fits perfectly into this market place So if you are considering installing an integrated access control system,we suggest you look seriously at the paxton Net2 range. This entry was posted on Sunday, March 13th, 2011 at 14:18	and is filed under Access Control. You can follow any responses to this entry through the RSS 2.0 feed. You can leave a response, or trackback from your own site.